Camp Bimini is situated on 15 acres of land located on Perth Road 113 (also known as the Embro Road). Camp Bimini is home to many trees (cherry, hemlock, maple, beech, birch and more). Blue jays, chipmunks, deer, carp, raccoons, crayfish, squirrels and butterflies are just some of the creatures found at Camp Bimini. A winding Trout Creek makes its way through Camp Bimini and provides a home for many. 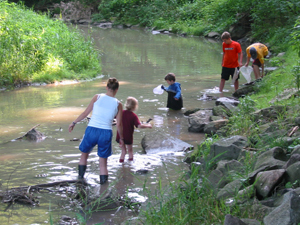 During our summer camp program, if creek levels permit, we often explore the creek. Our large mess hall is a great place for meeting as a large group. 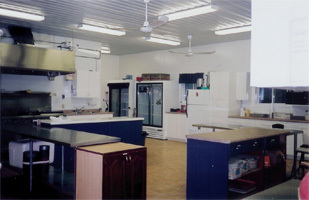 Recently renovated to include a heated floor, the mess hall serves as the hub of the activity at Camp Bimini. Attached to the mess hall is our large, bright kitchen which is fully equipped with industrial dishwasher, propane stove/oven and refrigerators and freezers. Washroom facilities, with showers are also attached to the mess hall. 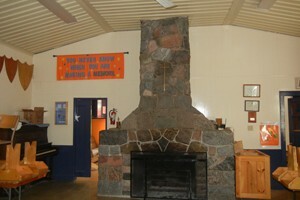 A large stone fireplace graces the mess hall, providing a cozy, warm feeling on a cool day. 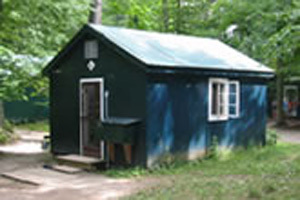 There are 12 cabins at Camp Bimini which are used by our summer campers. Each cabin will sleep up to eight in bunk-bed style. We are grateful for our cabin sponsors who look after the basic clean-up of the cabin each spring. Our playing field invites us to play. This open space allows us to play large games or picnic on a summer day. The possibilities are endless there. Each evening, campfire brings us together. 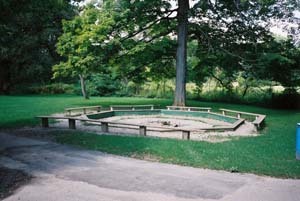 This large area (capable of seating 120 people) provides a safe place to have a campfire and sing those great camp songs. On a hot summer day, the pool is the favourite spot to be. 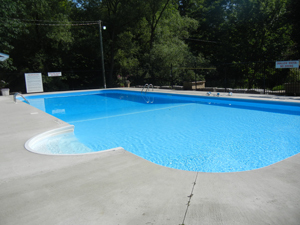 Open from early June to late August, the pool provides hours of fun. Perhaps one of the most peaceful places at Camp Bimini is Vespers. 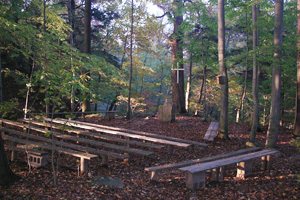 This outdoor chapel is nestled under the canopy of many tall trees. Each night during the summer after campfire, we gather here to reflect on the day we had and the day to come. We listen to stories, sing songs and pray. Our newest building in our space is our pavilion located beside our craft cabin. This spacious shelter is a great space for a sunny or rainy day. 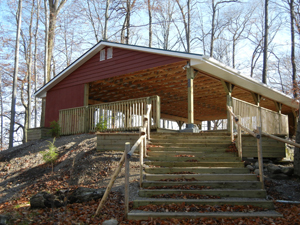 Other buildings on the property include a craft cabin, where campers showcase their creativity, a nurse’s cabin, program staff sleeping quarters and maintenance sheds. Camp Bimini is committed to ensuring our services meet accessibility standards. Please review our accessibility policy and contact us if you require more information.